The Midnight Review: The New Romneycare! Mitt Romney was for Obamacare way before Obama was known at the national level. Now he is against Obamacare - well, parts of it - and while he still sometimes touts his signature healthcare reform in Massachusetts Romney is now promoting a new style of health care reform for America, that is if he had his way and was able to repeal Obamacare on day one. You see, Mitt Romney solution is simple and is indicative of his inability to understand or even relate to the middle class. If you are uninsured, Mitt Romney would tell you to go to the emergency room. Despite holding an opposite opinion on emergency room care a couple years ago, now it is good enough for the unwashed entitlement-loving masses that Mitt Romney despises so much. As for the rest of the lazy freeloading leaches Romney so affectionately called the "47 percent of the people who will vote for the president no matter what," otherwise known as those people who feel access to food is a right, not a privilege, Romney leaked a little more of his plan for America today - those people need to pay more for health care to appreciate health care more. Mitt Rommey wrote in the New England Journal of Medicine that lower premiums but higher deductables would make health care more accessible by offering variety in the marketplace. Oh yeah, it will teach us "47 percenters" some personal responsibility. That line says it all about Romney's personal beliefs, especially when considering Romney's secretly recorded speech. The uninsured don't care about healthcare costs so by creating policies that are cheaper to obtain but more expensive to utilize those individuals will soon care more and become more responsible. The logic: "Healthcare is the only service in the United States that you buy and use without knowing what the price is," said Dr. Scott Atlas, a Romney adviser with Stanford University's Hoover Institution. "If you're paying out of a health savings account, you actually see the bill. It really does reduce prices." Not only is this completely false, highlighting the disconnect Romney has with the vast majority of the American electorate, it does nothing to solve the economic strain the current health care system presents itself to the middle class. Lower premiums but higher deductibles means greater out-of-pocket expenses for a population that cannot afford higher premiums and lower out-of-pocket expenses. All Romney's plan does is just shift a greater burden onto the middle-class and for Romney this is all fine, because as he stated in his secretly taped speech, Americans should not be entitled to health care. Update - It appears Paul Ryan has had a "47 percent" moment of his own. In a keynote speech he delivered for The American Spectator's 2011 Robert L. Bartley Gala Dinner, Ryan stated that 30 percent "want their welfare state," 70 percent "want the American dream." Ryan continued by claiming 70 percent of Americans get more bang for their buck, with 70 percent of the population getting more benefits then they pay in taxes. "Today, 70 percent of Americans get more benefits from the federal government in dollar value than they pay back in taxes," Ryan said. "So you could argue that we're already past that [moral] tipping point. The good news is survey after survey, poll after poll, still shows that we are a center-right 70-30 country. Seventy percent of Americans want the American dream. They believe in the American idea. Only 30 percent want their welfare state. What that tells us is at least half of those people who are currently in that category are there not of their wish or their will." 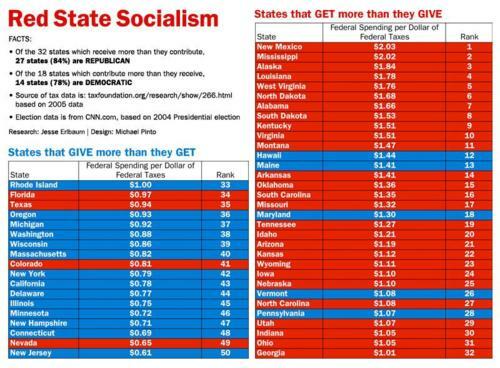 This is interesting when you contrast Ryan's statements with the fact that conservative states take more from Washington than they put in. I guess when Paul Ryan was claiming 30 percent of Americans want a welfare state he was talking about Republicans.